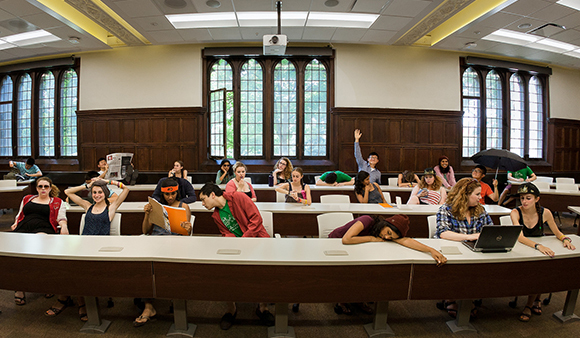 Just how interdisciplinary is the University of Chicago? Cross listed courses—those offered by more than one department, center, etc.—provide one clue. Tied for the most cross listings of all time, with 11, are Love, Capital, and Conjugality: Comparative Perspectives from Africa and India (primary listing: South Asian languages and civilizations) and Human Rights and Human Diversity (primary listing: Pozen Family Center for Human Rights). The most mysterious offering in the top 10, Comparative Metrics, is a comparative literature course. “This class offers an overview of major European systems of versification, with particular attention to their historical development,” states the description. “We are particularly concerned with Graeco-Roman quantitative metrics, its afterlife, and the evolution of Germanic and Slavic verse.” Working knowledge of one European language besides English is strongly recommended.